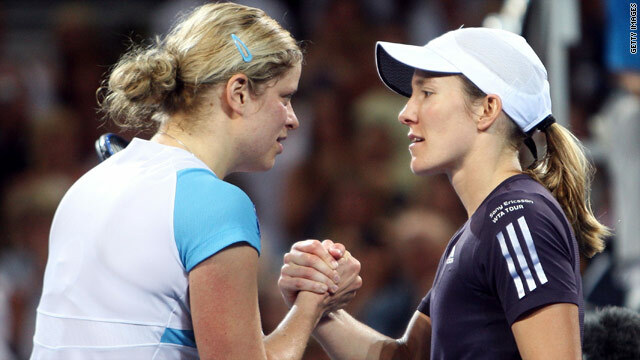 Kim Clijsters, left, has now beaten her Belgian rival Justine Henin 11 times in 23 encounters. (CNN) -- Kim Clijsters defeated fellow comeback queen Justine Henin in the final of the Brisbane International on Saturday, saving two match-points and wasting three as she won an epic clash. Henin, playing her first tournament since May 2008, fought back from a set and 4-1 down against her fellow Belgian before losing 6-3 4-6 7-6 (8-6) in almost two and a half hours. However, Henin sustained an injury to her left leg and later confirmed on her Web site that she will miss next week's Sydney Invitational, where she faced a possible second-round clash with Serena Williams, in order to recover in time for the decade's first Grand Slam event, the Australian Open. Clijsters, who made history in September as the first unseeded player to win the U.S. Open in her third event back on the WTA Tour following her own short-lived retirement, took control as she won eight straight games. But fellow former world No. 1 Henin dug deep to level the match and then take a 3-0 lead in the deciding set. The 26-year-old Clijsters battled back to tie it up at 3-3, and then both players squandered potentially match-winning break opportunities to ensure a tie-break. Clijsters raced to a 5-1 lead, helped by her first ace of the match -- coming off a second serve -- but then missed three match-point chances at 6-3. Henin again fought back to level at 6-6 but then her 11th double-fault gave Clijsters the chance to finally close out for victory, her 11th in 23 meeting between the two players. Clijsters clinched her 36th WTA Tour title, leaving Henin stuck on 41. "What a match!" Clijsters said. "I think we set the bar pretty high for ourselves for the rest of the year. Justine played at a really high level for the whole tournament, so congratulations." Meanwhile, top seed Andy Roddick will play defending champion Radek Stepanek in Sunday's men's final at the Pat Rafter Arena. Roddick came from behind to beat Stepanek's fellow Czech Tomas Berdych in the semifinals on Saturday, with the American winning 1-6 6-3 6-4 despite being broken for the first time in the tournament in his opening service game. Second seed Stepanek won 6-2 6-1 against Frenchman Gael Monfils, who was struggling with a shoulder problem. The world No. 13 told the tournament's Web site that he was unsure if he would take part in next week's Sydney International. In New Zealand, third seed Yanina Wickmayer shrugged off her difficult end to 2009 by winning the ASB Classic in Auckland on Saturday. The 20-year-old Belgian, who won her appeal against a one-year ban for failing to report her whereabouts for doping tests, defeated top seed Flavia Pennetta 6-3 6-2 to clinch her third WTA Tour title.